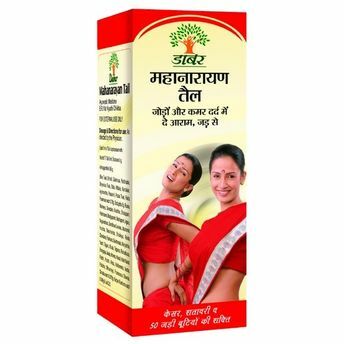 Dabur Mahanarayan Tail, is an Ayurvedic Composition whose massage is very beneficial in relieving joints, back & ribs pain. It strengthens the nervers, muscles & bones. This oil is very beneficial for children, adults, elderly people & women. Usage: Just rub it on the affected area, preferably do hot fermentation for optimal benefits. Explore the entire range of Massage Oils available on Nykaa. Shop more Dabur products here.You can browse through the complete world of Dabur Massage Oils .Alternatively, you can also find many more products from the Dabur Mahanarayan Tail range.